Shyam is a young working professional from Wipro Technologies. He developed a passion for higher studies while he worked at Wipro. And hence his journey with GRE and GREedge blossomed with a lot of enthusiasm. Despite his tight work schedule, Shyam somehow found sufficient time to prepare and he scored a very good 315 in GRE. He looks forward to specialize in the field of Industrial Engineering either at Carnegie Melon University or Purdue. To understand about his GRE Online preparation process and his success mantra, we decided to have a small conversation with Shyam, the man himself. What are you currently doing Shyam? Can you please tell us about your GRE scores? I initially joined GREedge for preparation and got a score of 315. I scored 156 in Verbal and 159 in Quant. When I joined I was not at this level; my diagnostic score was way below than this. But, after repeated practices and tests, I achieved this score through sheer hard work. Hard work is always fruitful. Complete GRE verbal practice testhappened to be a perfect launch pad to pursue my dreams. When did you join GREedge? How did you prepare for Verbal? I think Verbal is pretty much my strong point compared to Quant. I used to read a lot of articles, columns in Cricinfo and other stuff. I also used the Wordbot feature to learn vocabulary. Finally, I got a verbal score of 156 which I consider a pretty decent score. I started learning vocabulary from Day 1. I used to go through the meaning, learn the synonyms and then use it in a proper sentence. Reading Comprehension, Text Completion, and Sentence Equivalence- What did you do? RCs can prove to be very difficult. But you should break them down, analyze them and then read it. After doing this, you’ll be able to answer all the questions using a few quick techniques. There are a lot of question types like Inference questions, Negative, and Positive questions. Understanding them is very important and SFAs will help you out in that. Wordbot is the right key here. Sentence Equivalence is a bit tricky. From the six answer choices, any of the options might suit in. But, only 2 choices will be exactly matching the question. Having a sound knowledge of all the GRE words will definitely help. Learning words with the closely associated words is the best way to cope up with Sentence Equivalence. Text Completion tests your ability to put the word in the right context. GRE verbal practice test part comprises of these three. With the right amount of practice, it’s very easy to score above 160+ in Verbal. Get Started with Vocabulary with WordBot from GREedge. Learn with pictures, audio pronunciation, root words & mnemonics etc. What did you do for Quant? For Quant preparation, I primarily relied on the old mantra “PRACTICE”. Practice till you gain sufficient knowledge in all the areas. Once you get that, you can solve any type of problem irrespective of the difficulty level. Initially, I would suggest to learn concepts thoroughly, write down the formulas in a sheet of paper and keep the paper adjacent to you while solving. Gradually your memory power will increase and you will automatically use the formulas. I believe certain topics in Quant need more concentration. But trust me, it’s just basic mathematics. With the right preparation methods, you can easily score 170 in Quant. Why do you think AWA is very important? I got a score of 3.5 in AWA section. I think this section is being avoided by most of the GRE aspirants. But believe me it is one of the most important section. The admissions committee would be able to evaluate your writing capabilities through the section. These guys are not looking for a perfect 6. It is very tough since we are not native speakers of English. But having a sound knowledge of vocabulary and grammar can fetch a score of 4+ which is considered to be a very good score. Would you like to share your experience with GREedge? Yes, I would love to. In a nutshell, learning experience with GREedge was awesome. Initially I had a dilemma whether to trust an online academy and invest my father’s hard earned money over there. But later after attending a lot of seminars, I came to a conclusion that I should join an online academy and that would definitely be GREedge. After the registration process, they gave a diagnostic test where the SFAs were able to guess my abilities in Quant and Verbal. My diagnostic score was very average. Losing the touch right after college, it was difficult to score well in the diagnostic test. My SFAs evaluated the responses and designed a perfect study plan for me to concentrate on areas where I was weak.. I was pretty strong in Verbal than Quant. For Quant, my SFAs helped me out and I was able to do well. I spent 6-7 hours during the final stages of preparation and I would like to thank GREedge for the score. Without them, it wouldn’t have been possible. What do you think is very exciting about GREedge? You would get a lot of free time during college. But in a workplace, getting the job done should be our top priority. After going home, you would definitely want to relax. Going to a coaching center for GRE after hectic work schedule might be impossible. I was looking for some place where I could use my available time effectively. Finally, I found out GREedge platform where everything is online. You need not come physically to any place. Be it weekends or weekdays, you can log in from wherever you are. 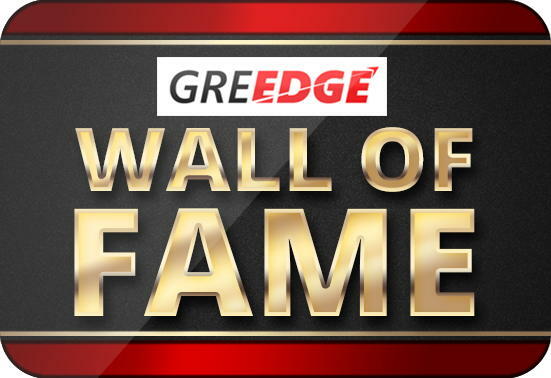 This is an exciting factor for Working Professionals to consider choosing GREedge. How did your SFAs at GREedge help you? There is an exciting concept called SFAs (Student Facilitators & Analysts) in GREedge. As the name suggest, they facilitate you throughout the GRE process. It is one of the bright features of GREedge. You will be able to contact your SFAs anytime and they will get back to you in the next 24 hours with relevant solutions. Experience with GREedge in one word? If I should explain my experience with GREedge in one word, then I would use the word “SANGUINE”. Sanguine means pretty optimistic and positive during odd times. This word would perfectly suit my learning experience with GREedge. My success mantra is to be good at whatever you do. Do your best and wait for the rest. What is your word of advice to all the GRE aspirants? My advice to all the GRE aspirants would be to use the Learning Tracker from GREedge. Learning Tracker has all the resources which are required to get 340 in GRE. It is designed with cutting edge technologies and the information available there is very good. Please make full use of the Learning Tracker from GREedge. Most of the working professionals suffer due to their tight hectic schedule. They become very lethargic and do set aside enough time to prepare for GRE verbal practice test. Like Shyam, if the right GRE program guides you through your tough times, every working professional can go ahead and crack the GRE effortlessly. Shyam’s experience with GREedge has been amazing. He prepared with Complete GRE program from GREedge and that helped him boost his GRE score to 315. If you wish to break the obstacles and get a high GRE score using Complete GRE, you can click here. You can also share the article with your friends who are working and looking forward to preparing for their GRE with the GRE verbal practice test. You can also comment below if you have any doubts or call us at: +91-98844-53276. We will make sure you get a call from our GRE experts and help you out with your specific problems. I had the good fortune of reading your post regarding Verbal Ability. Thanks a lot for writing such post. I must say this is one of the best posts on Verbal Ability that I have come across. To all your readers I want to recommend VERBAL ABILITY TESTS (link below) to check out where their Verbal Ability stands. These tests are very helpful. Can I give GRE for MBA?